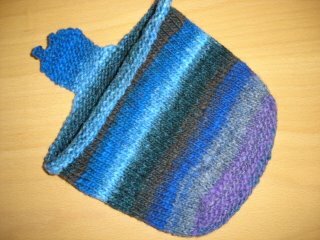 Inspired by Seahorse Claire's recent knitting (OK, I confess, copying Seahorse's recent knitting - thanks Claire!) 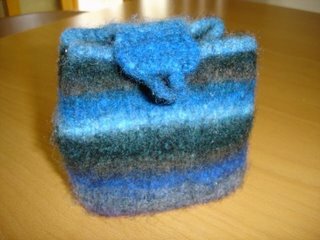 I looked up the pattern for this Teeny Tiny Tote and made it yesterday - took one ball of Noro Kureyon and an evening to knit. It's been through the washing machine cycle with two loads of towels (beware, the colour runs!) and is ready for handles and fastening. Cute, isn't it? This was the bag before felting. I have another ball of Noro to make one more Teeny Tiny Tote, and then I think I'm ready for the French Market Bag from knitty.com I have three balls of Manos del Uruguay in "Jungle" (dark greens and blackish browns with a flash of lime green) bought at Purl in NYC last Summer which have been saying "felt me" since then, and I think that, at last, I have courage! Apr 14 This is a tulip!